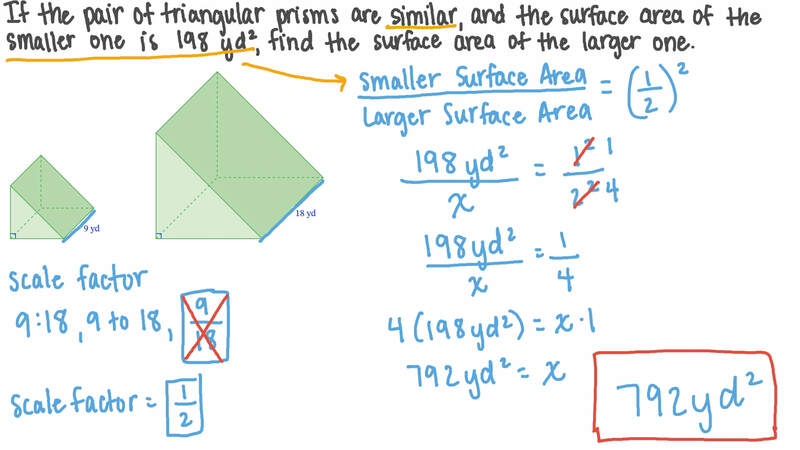 In this lesson, we will learn how to use the similarity of two solids to find their dimensions, areas, and volumes. 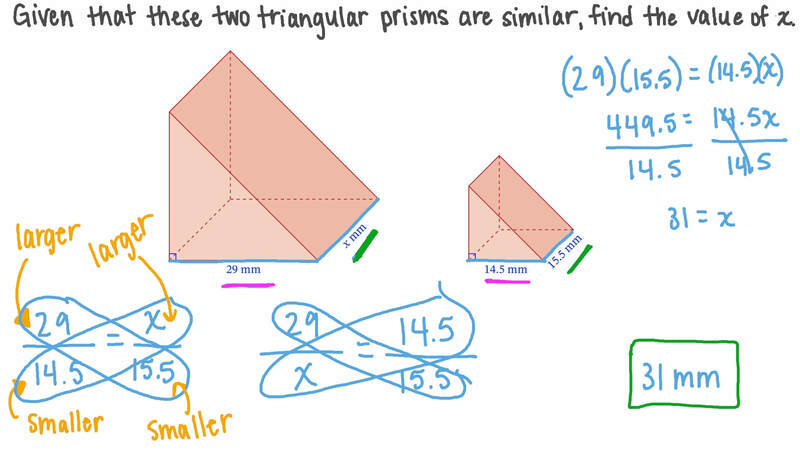 Given that these two triangular prisms are similar, find the value of 𝑥 . The figure shows two cubes. If the area of the smaller one is 143, and the sides are in the ratio 1 ∶ 5 , what is the surface area of the larger cube? If the pair of triangular prisms are similar, and the surface area of the smaller one is 198 yd2, find the surface area of the larger one. A pair of cones are similar. Cone A has a base radius of 17 cm and a slant height of 20 cm, whereas cone B has a base radius of 𝑥 cm and a slant height of 48 cm. Determine the value of 𝑥 . A pair of square pyramids are similar. Pyramid A has a base side of 125 in. and a slant height of 160 in, and pyramid B has a base side of 𝑥 in and a slant height of 32 in. Determine the value of 𝑥 . 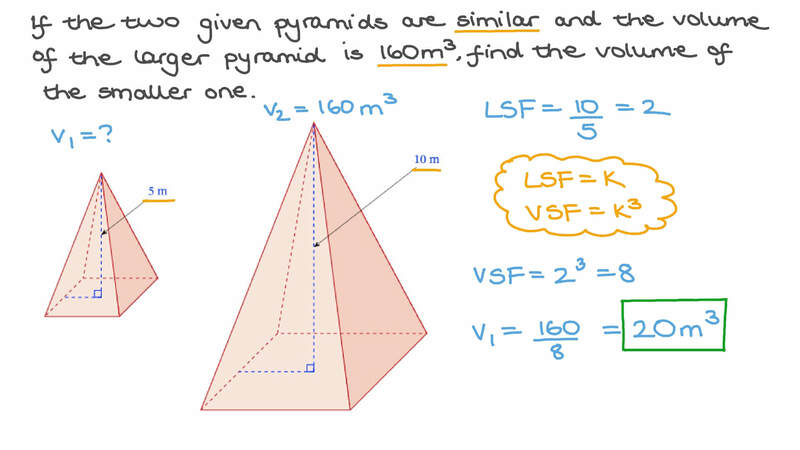 If the two given pyramids are similar and the volume of the larger pyramid is 160 m3, find the volume of the smaller one. A pair of regular triangular pyramids are similar. Pyramid A has a base side of 17 inches and a slant height of 20 inches, whereas pyramid B has a base side of 𝑥 inches and a slant height of 42 inches. Determine the value of 𝑥 . A pair of rectangular prisms are similar. Prism 𝐴 is 104 by 32 by 24 inches, while prism 𝐵 is 26 by 8 by 𝑥 inches. Find 𝑥 . A pair of cylinders are similar. Cylinder A has a base radius of 29 inches and a length of 6 inches, and cylinder B has a base radius of 𝑥 inches and a length of 18 inches. Determine the value of 𝑥 . The surface areas of two similar solids are 64 square yards and 361 square yards. Find the ratio of their linear measures. The given pair of rectangular prisms are similar. If the surface area of the smaller rectangular prism is 310 yd2, determine the surface area of the larger one. A cone has a volume of 11,756 cubic centimeters. Suppose that its dimensions were reduced to the current value, find the volume of the resulting cone. The Newton High School Cheerleaders are making megaphones out of cardboard for a big game. The megaphone is a large cone, as pictured, with a small cone removed in order to shout the cheers through and amplify one’s voice. Given that the cones are right cones, identify the height of the smaller cone. Find, to two decimal places, the surface area of the cardboard which makes the small cone. A tower casts a 102-foot shadow. At the same time, a post near the tower that is 40 feet and 7 inches casts a shadow of 35 feet and 8 inches. Find the height of the tower in feet and inches to the nearest whole inch.